Meet Cucumber, the fruit and the vegetable. At least in Nigeria, it is. On the right fork where Old Aba road meets the Aba expressway in my city of Port Harcourt, women sit on wooden stools and chairs, selling wares. These squat seats, close to the ground keeps them close to their planks full of cucumber pyramids. Cucumbers stacked in threes to form long, geometric shapes. On an evening drive home, I might see men and women, tired after a hard day’s work, snacking on cucumbers. 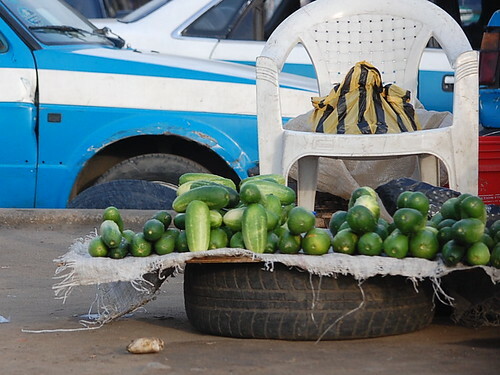 For in Port Harcourt, cucumbers are both fruit and vegetable. They are plentiful, refreshing and cheap. Cucumbers are always around me, it seems. Even in New York. One daughter and the son have it often as their sides. With ketchup of course. Daughter No 1 thinks everything tastes better with ketchup. 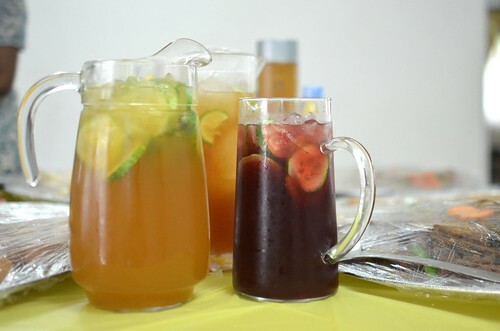 I love it in drinks. Like Chapman, and Lemonade. I think its cooling essence and its clean flavours shine through in liquids. And in salads, like Jeffrey Alford & Naomi Duguid’s Spicy version where sweet and sour pickled cukes are replete with three sources of heat – black pepper corns, dried red chilies and fresh green chilies. I must confess though that the most interesting way I’ve had them is fried. With eggs. In an omelette gone wild-style. And here, at home in New York. For Sunday Brunch, my sister’s in-laws and family made up a huge batch of Nigerian-style fried eggs, with red potatoes. Kind of a deconstructed skillet meal. 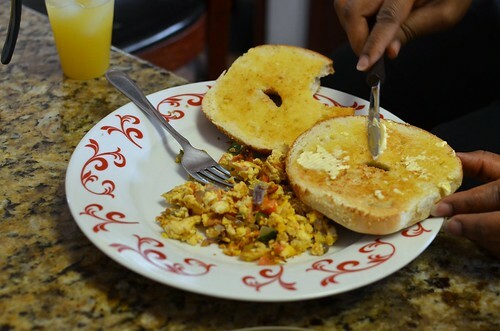 Typically, Nigerian fried eggs are vegetable rich eggs, often consisting of chopped tomatoes, red onions and peppers. The peppers could be hot, or bell peppers or a combination of both. These ingredients form the base for the eggs, which are then folded in and cooked either as an omelette or as ‘scrambled’ eggs, where scrambled is a loosely applied term. These won’t form soft, creamy curds, that are delicately held together by barely cooked eggs and milk. No. These will form curds, but they will be well-defined. The resulting eggs will likely be soft and juicy, thanks to the vegetables and they will be delicious. A touch spicy, if you like, well-salted (if you’re not me) and enjoyed by all. A perfect accompaniment to bread, yams, plantains and potatoes. 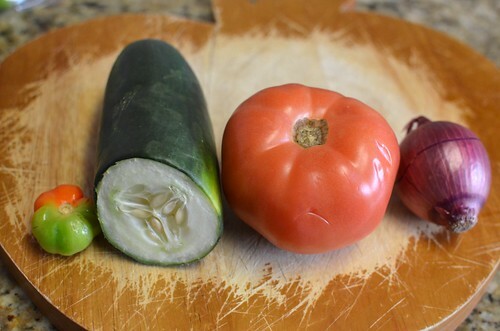 To begin, you get out the vegetables you like. 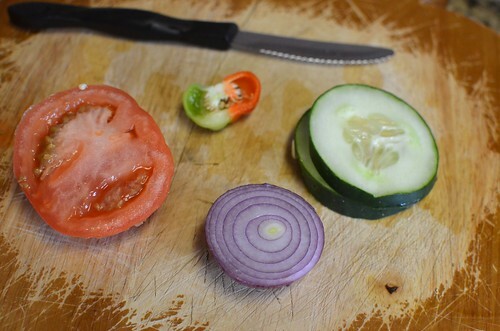 In this case, I have chilies, cucumbers, tomatoes and some red onion. The proportions for this dish are flexible – dependent on how you like your eggs. More eggs than veg, more veg than eggs…or equally balanced. The choice is yours. 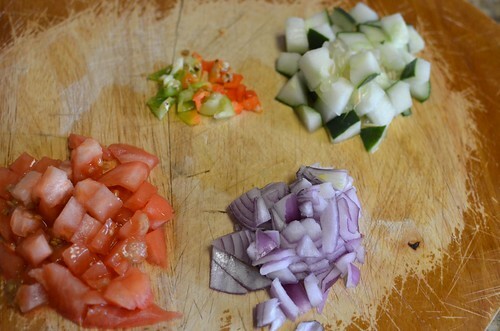 How you cut up the veggies too is your choice. I love a fine (ish) dice in my eggs – it makes it easier to eat. 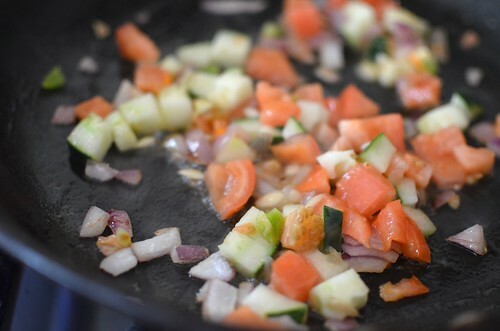 Once you’re ready with your vegetables and your eggs, its time to heat up the skillet. 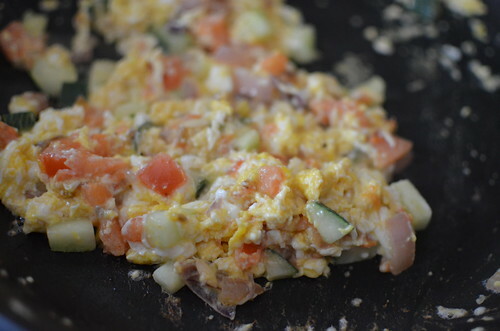 For this recipe, I’ve used two eggs, along with 1/2 a small red onion, 2 slices of cucumber diced, a quarter of a large tomato and 1/3 of a chili pepper. The pan is heated up with some oil or cooking spray and I start with the onions, softening them with a pinch of salt for a minute. They don’t take on any colour before I add the other ingredients. I don’t save the cucumbers for last. I allow them cook for a few minutes, seasoning with salt. No black pepper is added, the fresh chilies are sufficient heat. I then add the eggs…. 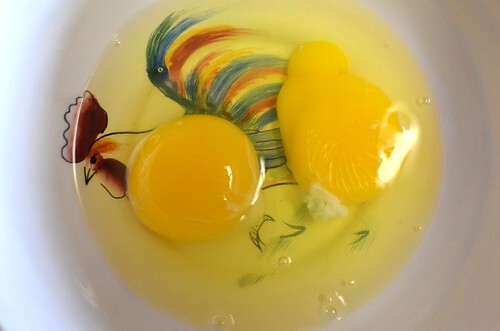 ….which are scrambled in the pan. I’m not a big fan of omelettes, and neither is my sister. My pregnant sister who this is for. The unmixed eggs ensures the results are soft, and not tough. And in minutes, the eggs are ready. The cucumbers are delicious. They soften without getting mushy. Who knew that was possible? Most of all, they have an herbaceous quality, some ‘green’, freshness that they bring to the dish. 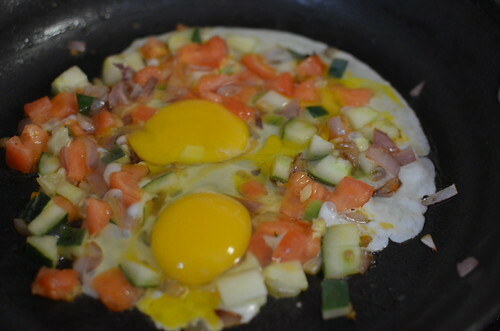 The eggs are great overall – juicy, soft, perfumed with the scents of vegetables. I bet my daughter would love this. 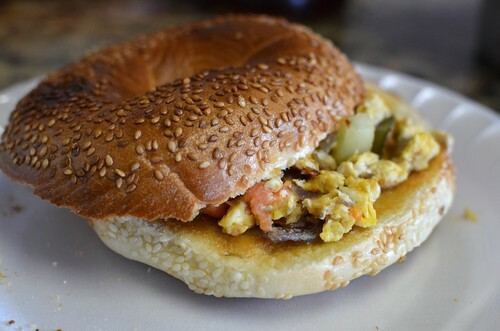 And this is the breakfast that fills my belly, and sets me on my merry way…to Manhattan. To Kalustyan’s, to seek out a thrift store and to envelope myself in friendship’s warmth at Norma’s house.